Nemo left us with a foot of snow and I have pictures to prove it. The City dealt with it pretty well. Around 3 o'clock on Friday, everyone started preparing for their journey home. Limited train schedules and subway delays had prompted early dismissals from work. By five, Midtown and Times Square felt like a ghost town. Connecticut had declared a state of emergency and events in New Jersey were already cancelled. 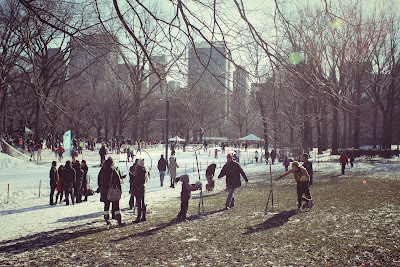 I took advantage of the snow the next day by heading out to Prospect Park in Brooklyn. NYC Parks was sponsoring a snow day with free hot chocolate, sledding, and snow angel contests. 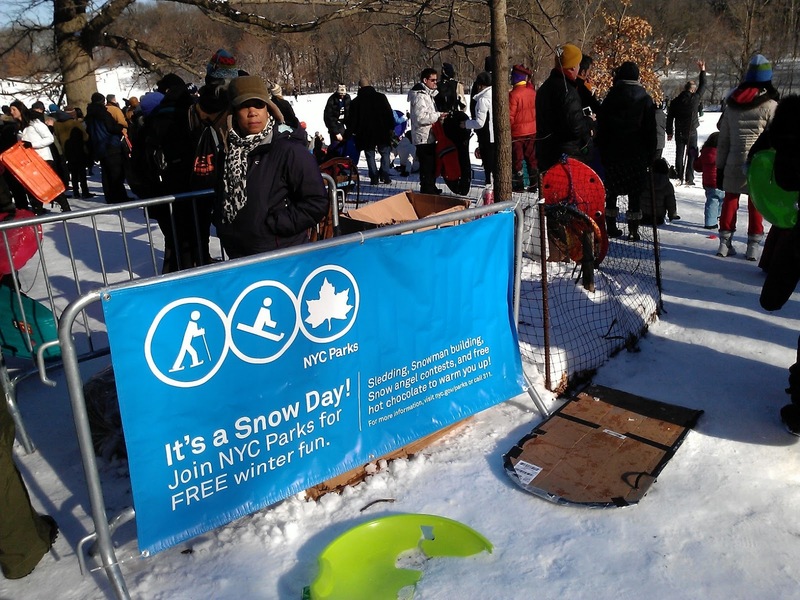 We had our own sleds and did what other New Yorkers did: lugged them on the subway and walked a few avenues to get to the park. What fun it was. I had never gone sledding before. There is a rush going down the hill and a moment of terror and fear right before taking the plunge. It was amazing to see the range of sleds people had from age appropriate sleds and wooden ones to plastic ones and inflatable tubes. No sled? Some were really resourceful and used plastic tub lids and cardboard boxes to garbage can lids and 8 inch cutting boards. 1) Wait your turn. Don't cut in line. Patience! You won't be standing on top of that hill for more than 5 minutes before sliding down. 2) Wait until your path is clear. Are there children or adults in your way? If so, give them a minute to get out of your way. It is your job to avoid a collision. If you find yourself headed for one, take a sharp turn to stop! 3) After your run, don't walk back up the hill in the path of the sledders. Walk on the side where it is safe. Here we are violating Rule #3! After sledding we went in search for a good area to make snow angels. Prospect Park was absolutely gorgeous. We made our own snow angels and a mini snowgirl. I even came across a tiny igloo. The snow was great, powdery, and clean. After mucking around for about three hours, it was time to go home. On the way back to the subway we found a little diner that sold fresh donuts and hot chocolate. No better way to end an adventure than with such a sweet treat! 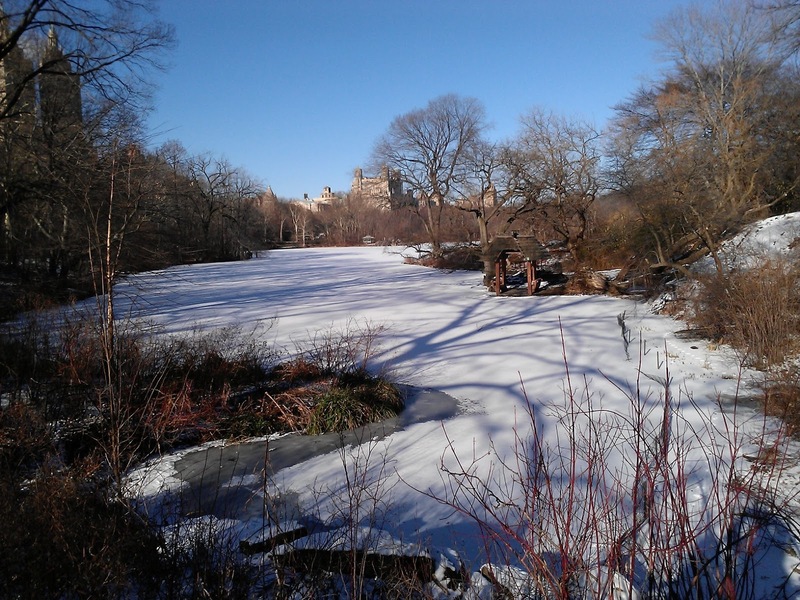 Have you ever experienced Central Park laden with snow? It is one of the most beautiful sights to be seen and enjoyed. 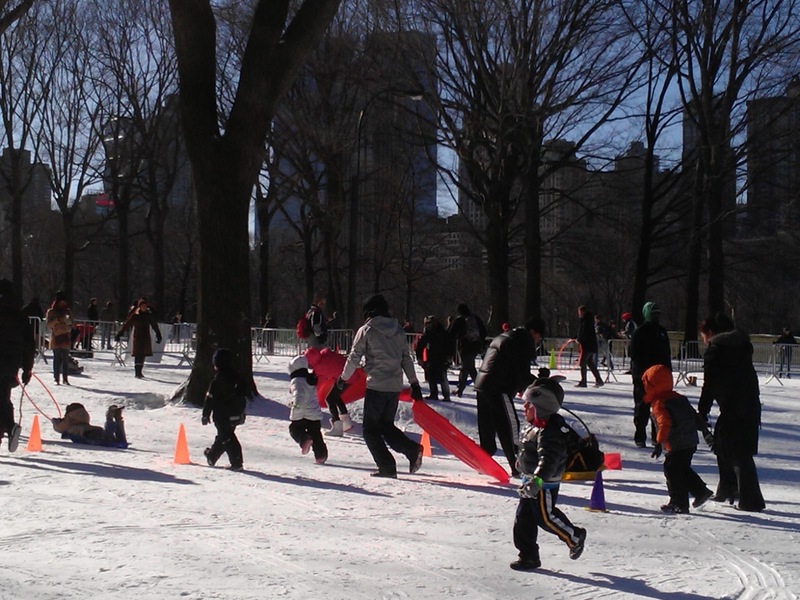 Children bring their sleds, saucer discs, and cardboard pieces to help them coast down tiny hills. It is surprisingly safe and well organized. The kids are accompanied by their parents and they all take turns gliding down one by one. I have never seen so many children so patient waiting for their turn. 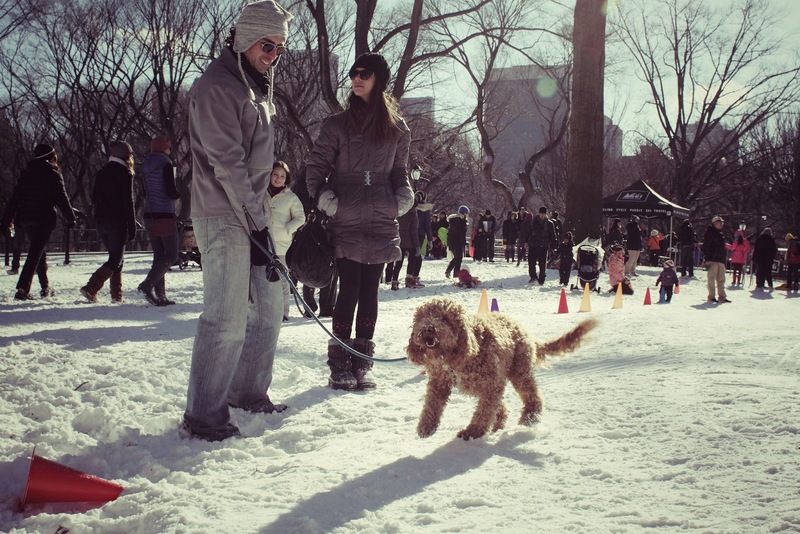 Central Park transforms into a mini Winter wonderland. In January, the New York City Parks Department, along with the Olympic Regional Development Authority and Gore Mountain, hosted the 2013 Winter Jam. Winter Jam is an annual event which glorifies snow and Winter sports. I went to check it out and made sure to wear my snow boots. Gore Mountain provided tons of synthetic snow. You would have never known the snow was fake since it actually snowed the day before and the snowy landscape blended all together. Winter Jam gave New Yorkers a chance to try out a few Winter activities like skiing, snowboarding, sledding, and snowshoeing without having to travel upstate or to any other of the nearby mountains in New Jersey and Pennsylvania. 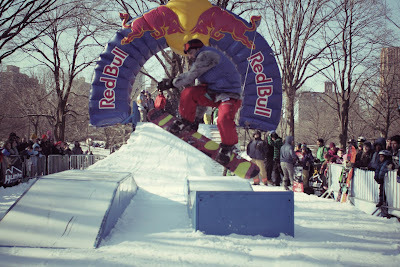 There were snowboarding tricks demonstrated and sponsored by Red Bull, ice sculptures you could sit on and pose with, and a doggie snow zone. The festival had entertainment in every corner. In addition to the sports and recreational areas, there was also a live band, food vendors, free samples, and an animal adoption agency on site. Needless to say, there was a lot going on! The festival was geared largely to children. There was a Learn to Play Quidditch area through a local Meetup group, Radio Disney on site, and various games to play. 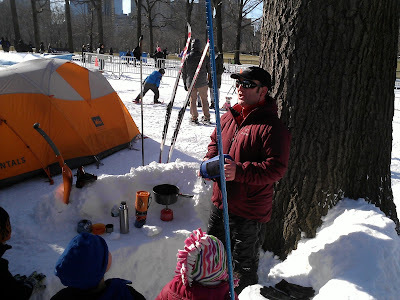 I took interest in an educational Winter camping and survival demo. Learning how to shield oneself from the snow and wind while collecting water to boil are important skills to master. Everyone was required to sign a waiver if they wanted to participate in the activities. The festival was divided into sections. The snowshoeing area had no line. I walked right in and was seated to be fitted into snowshoes. 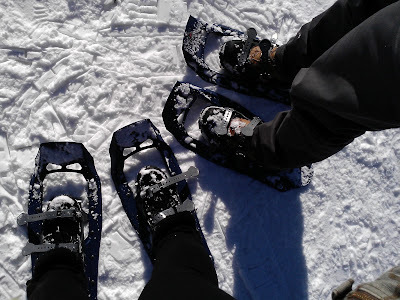 Much to my surprise, snowshoes did not look like tennis rackets! I had watched one, too many cartoons. The snowshoes I tried on snapped onto my boots and when I walked, they moved with me. They looked and felt like they were made out of plastic. They were very durable despite their lightness. 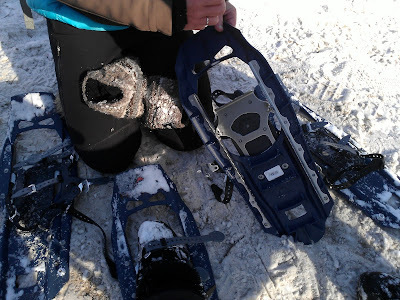 The snowshoes gave my boots a larger support surface and I was even able to run in them. Snowshoes prevent you from sinking into the snow. I had a great time stomping around and am now ready for a Winter hike! After snowshoeing, I wanted to try cross-country skiing but the line was a good hour long wait. I took it as a sign to move on. There was much to explore! I spent a good two hours at the festival overall. I walked through Central Park the rest of the afternoon. I came across Betheseda Fountain. Behind the fountain, the same lake I rowed a boat in had now become iced over. I could not believe this was the same park that was usually green and filled with people in shorts and t-shirts. Now the park looked like a page out of a L.L. Bean catalog, Winter edition.